When Luis Escobar asks “Do you want to do something epic?” you should either sit down, or run away. You never know what to expect. You might end up hitchhiking across Death Valley in 130 degree heat or spend a night cuddling with 3 other guys under one emergency blanket in below freezing temps on the top of Mount Whitney. One thing is for sure, it will get weird…but it’ll be a great story. 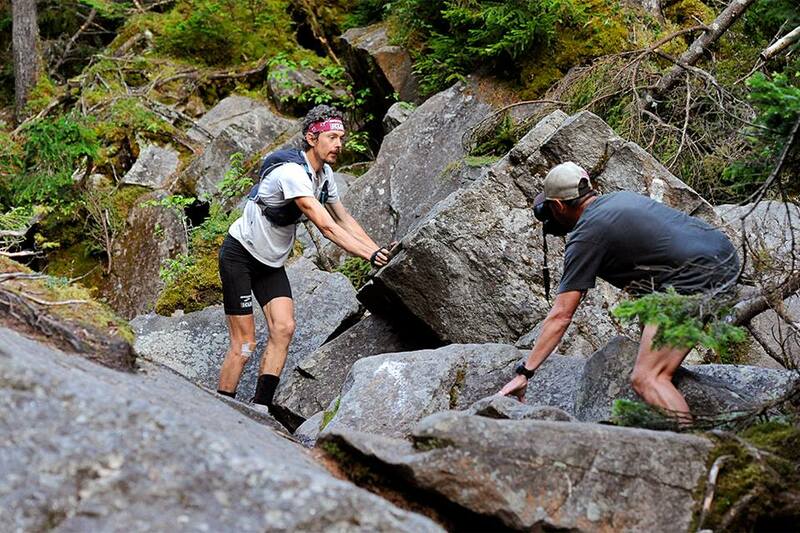 Disclaimer: If you are reading this hoping to find out how Scott Jurek broke the speed record on the AT you are going to be sorely disappointed. What he did was amazing and my 9 days with him were incredible, but that’s not my story. 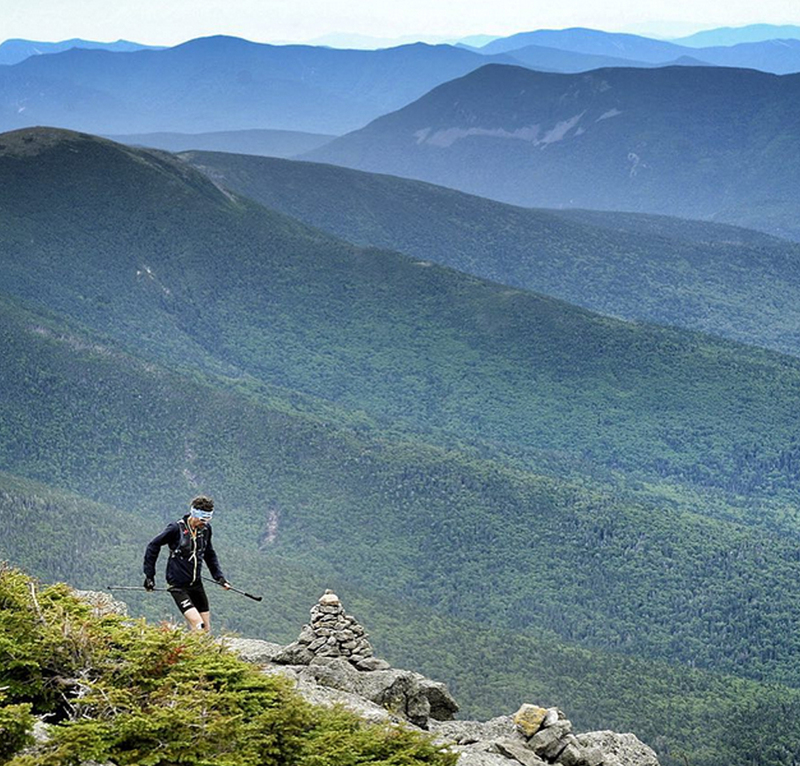 My story, this story, is about two photographers driving a rental car through the backwoods of New England, chasing the king of ultrarunning from white blaze to white blaze. The morning of July 3rd I left Phoenix for Boston and met Luis at the baggage claim. We made our way to the rental car kiosk and climbed into a bright red Hyundai Sonata that was in for the adventure of its life, as long as it survived. We drove north to meet Scott and his crew somewhere in the White Mountains. Several hours later we pulled into Gorham, New Hampshire and rendezvoused with Scott’s wife Jenny and Timmy O’Neill. It was after dark and Scott was out on the trail with two pacers, planning to sleep in one of the AMC huts for the night. We booked a room at the Colonial Fort Inn, aka, Hiker’s Paradise. An old German man came to the desk to give us a room key and walked us outside and grabbed our shoulders and turned us toward the street. He said, in a very serious tone, “Now gentlemen, the most important thing is that the gas station right down there is open 24 hours, around the clock, and has cold beer.” Say no more. Our alarms rang before sunrise. Luis and I stopped by McDonald’s for breakfast and sat in the same booth where Rafiki and I gorged ourselves several times during our thru-hike 3 years ago. We drove up the Mount Washington road behind Jenny and Timmy in Scott’s van. At the top the film crew was prepping gear and Jenny organized Scott’s resupply. A few moments later several figures appeared across the parking lot and there he was, a living legend, Scott Jurek. Luis and I doubled checked the camera gear as Scott refilled his water and food. Scott posed for photos at the Mount Washington summit and we ran with him across the ridge of the Presidential Range. I followed the group for 3 miles helping Luis with the cameras before turning back to drive the car to the base of the mountain. I parked at Pinkham Notch, filled my pack, and started jogging up the trail. This was the first time I had revisited the white blazes since finishing my thru-hike in 2012. The smell of the woods, the feel of the cool northern air, and the sound of the birds…it all flooded back to me. I was falling back in love with the trail. It felt good, it felt right, and I felt at home. A few miles up the trail I ran into Scott, his pacers, a few fans, and Luis. I turned around and ran back to the parking lot with Luis and prepared for the next section of photography. Scott refueled and we ran ahead to get shots of him heading out for the night. He would be staying in a hut again, so the crew drove back to Gorham to celebrate the 4th of July by sharing a pizza and downing a few large PBR’s. We ended up getting another room at the Colonial Inn to crash and recharge the camera batteries. In the morning Luis and I drove back to the same McDonald’s for breakfast. For never having lived in Gorham, I’ve spent an inordinate amount of time in that joint. We met Scott and the crew at the White Mountains Lodge and Hostel, snapped some photos of his stop, and joined him for the next section of the trail. Scott Jurek taking a quick break before heading back out on the AT. Someone told me about a “shortcut” 6 miles up the trail that would lead back to the hostel. We took photos and leapfrogged with Scott for 5, 6, 7, 8 miles, but never crossed the side trail. Around mile 10 we decided that was enough and turned around. The extended run back to the hostel gave Luis an opportunity to share his entire life story in chronological order, starting at birth and leading up to our McDonald’s breakfast that morning. Twenty miles later we reached the car. It was near sunset so we grabbed a room at the hostel, took showers, did laundry, and ordered pizza. 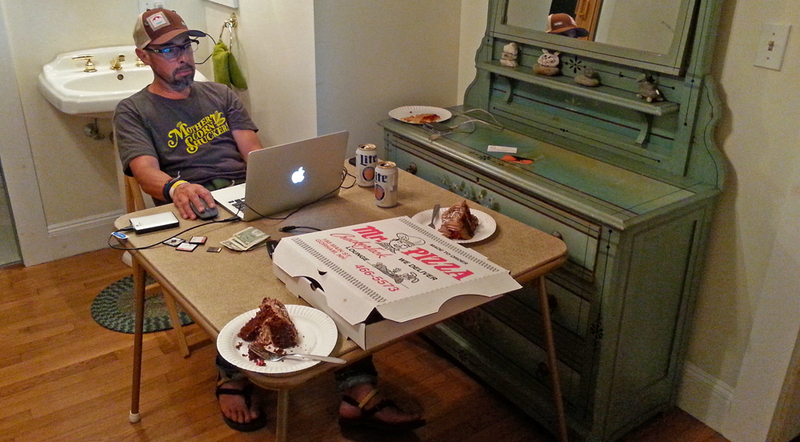 The staff offered us beer and chocolate cake left over from their 4th of July party. Lutinent Dan, an AT hiker staying in the hostel, stopped by to say hello. He asked, “Did you thru-hike a few years ago?” Yes. “Did you make a video about it?” Yes. “Is your name Tarzan?” Yes. “I knew I recognized you!” Wow, this guy had watched my video on YouTube and recognized me when I walked into the hostel. We started talking about the trail and his experience. I mentioned my hiking buddy Rafiki and he said, “You mean Benton?” Yes! He also knew one of my hiking partners from 3 years ago, small world! We chatted, Luis finished his editing work, and we hit the sack to get some rest before the next day. The next morning we were up before sunrise, stopped at a gas station for hot coffee, and followed dirt roads to find our way to the hardest mile on the Appalachian Trail, the Mahoosuc Notch. The film crew had arrived before dawn to carry in their heavy gear. Luis and I packed the cameras and hiked the 2 mile side trail to the Mahoosuc junction. We arrived, hashed out a plan for the shoot, and heard Scott and his crew approaching the notch. It was game time. I knew how difficult the notch would be. We started ahead of Scott, working with the film team to pick lines that would get the best images. Scott stuck to the purist AT path, scrambling over rocks, crawling through caves, and popping out on the other side. Luis and I took rapid fire photographs as the crew hung back and climbed their way through the mess. Luis told me to get down low and close to Scott to capture the emotion on his face. At times I was so close that I thought Scott might reach out and clock me for being in his way, but he was incredibly focused and pushed through the notch. By the end we were all tired, Scott and his crew moved north, and Luis and I turned back to traverse the notch again to grab our gear and hike back to the car. When I hiked the AT in 2012 I decided the Mahoosuc Notch was one of the harder sections and had no real urge to revisit it again, ever. That day, not only did I revisit it, I traversed it twice. One thing was for sure, it was much easier crossing the notch without a fully loaded backpack! Back in the car we followed the film crew to a local joint in Gorham and ordered the hungry man breakfast special. We spent the afternoon at the film crew’s hotel charging camera gear and relaxing. After grabbing dinner Luis and I headed out to the trail to get an update. On a deserted logging road outside of Andover, Maine we found Scott’s van. Scott popped out of the woods shortly before dark and went directly to the van to get a few hours of shut eye. In the morning Luis and I would be running with him through the next 13 miles, so we pitched a tent next to the road and tried to sleep as fully loaded logging trucks drove by just feet from our heads. Our alarms rang at 3 AM and Scott was stirring in the van. Luis and I climbed out of the tent and started packing gear. I looked up as headlights appeared on the road. A logging truck was making a haul and suddenly the headlights went dark. I squinted and could see a moose scampering down the road in front of the truck. The spooked moose was running for its life and made a last ditch effort to get off the road. Luckily it turned right. If it had gone left it would have trampled a tent and a few of our sleeping crew members. As the moose turned for the safety of the woods its hooves searched for traction, sliding on the pavement like the Bullwinkle cartoon on ice. Its back legs sprawled out flat, front legs grabbing for anything to help pull it off the road. At the last moment, brakes screeching from the truck, the moose and its hind end disappeared into the brush and the truck passed by unscathed. Whoa…who needs coffee when you wake up to that! Scott emerged from his van, unaware of the close call with the moose and the logging truck, and the three of us set out in the dark. Scott asked me to lead and I walked with my trekking poles in the air to break the spider webs for him. The sun rose and we pushed a little harder. It was one of the most intense sections I’d hiked on the Appalachian Trail, not because it was hard, but because I was leading Scott Jurek, and I needed to be sure we were following the white blazes. If I accidentally got lost it could mean a lot of wasted time for him. Luis, Scott, and I made good progress over the rolling hills in Maine. We talked about the trail, the towns, and the people along the way. I gave Scott a heads up about Maine. “I can’t sugarcoat it, it was one of the toughest sections of the trail, mentally and physically.” By mid morning we reached the parking lot of a scenic lookout. Scott refueled at the van and headed back out on the trail with new pacers. 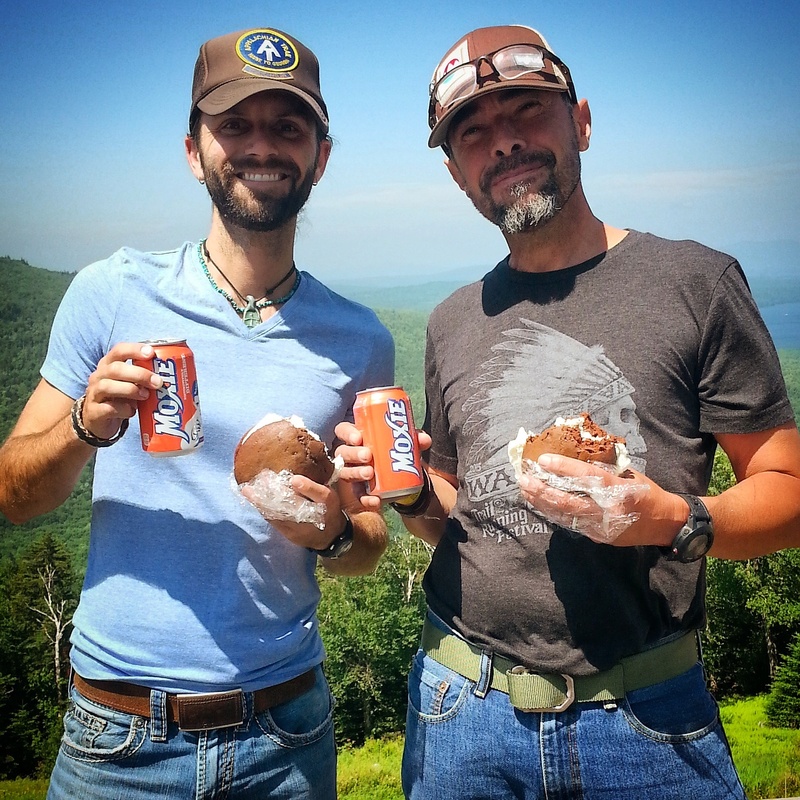 Luis and I celebrated a successful morning run with a couple of Maine staples, whoopie pies and a can of Moxie. Yuck. We drove to Rangeley to get lunch before meeting Scott for the afternoon. While we waited for our food I visited the bathroom and Luis came in and said “Chris, you are being called up to the big leagues!” “Luis, I’m in the bathroom man, I’ll be out in a minute.” “No, you are being called up to the big leagues, you are backpacking out with Scott and camping with him over night, you better get ready.” It was go time. With the change in plans I didn’t have time to stay for lunch. Luis and I drove to the AT crossing to prep my gear while Timmy waited back to get the meals. John Rodrigue, a local Maine trail runner, would also be pacing Scott overnight, and Jenny gave us his camping gear and food. John packed Scott’s tent and I took his clothes and a large Ziploc bag filled with his food. Before hitting the trail Jenny added 5 slices of pizza and two vegan muffins that a fan had dropped off. Scott was an eating machine, and all of that food was going to be heavy. The three of us hiked up the AT to Saddleback Mountain, ascending into thick clouds. The crew took a shorter side trail and met us at the top. When we reached the summit John and I held back so Scott could be filmed and photographed crossing alone. John and I stopped and found Timmy with a few cans of PBR. “Hey Scott, Timmy’s got a PBR for me, we aren’t in that much of a hurry, are we? Oh, we are? We’re trying to break a record? We gotta keep moving? I grabbed the cold can, chugged it, and caught up with Scott. We made the descent with dark clouds looming overhead. Soon they opened and a slight rain turned into a steady pour. 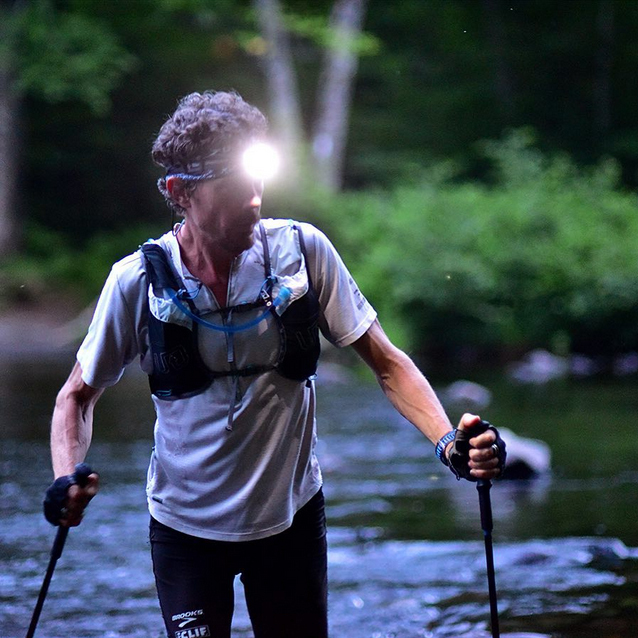 I walked behind Scott, watching the king of ultrarunning carefully pick his way over wet technical rocks while water flowed off the bill of my hat. It was going to be an uncomfortably wet night. But as we say on the AT, “No rain, no pain, no Maine”. The sun set and the rain let up to a cool drizzle. We donned our headlamps and slowed our pace as the light from the torches illuminated the cloudy mist better than the trail below. Our progress was slow, but at least it was forward. Around one corner I slipped on a wet rock and teetered sideways. I tried to catch my slide but ended up going lateral. I hit the ground and twisted over a ledge. When I stopped moving I was upside down and my trekking poles were clanking down the trail. I had landed on a tree root that strategically fit into the back pocket of my running shorts, leaving me hanging by my nylon bottoms. The guys made sure I was alright and I got back behind Scott and tired to be more careful. I watched as Scott weaved a bit, he was falling asleep. “Scott, is there anything we can do to keep you awake?” I asked. He said, “You got any music on your phone?” Crap… “Ummm, yeah, I have some country music, do you like country?” He shook his head, nope, that was not going to be an option. I looked through my playlists and we spent the rest of the night walking through the dark, listening to jams from the John Butler Trio. We reached the side trail to the shelter around midnight. John and I found a flat place to camp and pitched Scott’s tent as he slammed 5 pieces of pizza. Scott crawled in and we told him the alarm would be going off in four hours. John and I set up our own camp and hit the sack. Less than 4 hours later, our alarms rang. We woke Scott, pulled out his breakfast, and he hit the trail with John while I disassembled and packed the tent. Soon the dark forest started to illuminate with the gray light of sunrise. The clouds held strong and we crossed tricky technical rocks in the drizzling rain. Scott climbing over wet rocks in Maine. Several hours later we neared the next crew stop and Topher Gaylord ran out to meet us on the trail. Having his friends here to crew him to the finish was a huge moral boost for Scott. We picked up the pace and a mile from the road we reached Kim Gaylord and Krissy Moehl. We all ran into the parking lot and Scott was happy to get warm food and take a quick break. I dropped my pack and grabbed the camera and snapped photos. Krissy was taking off with Scott for the next section so I filled her in on our progress and wished her luck. They hit the trail and I followed the film crew to get some photos of Scott on top of Bigelow Mountain. Scott and Chris hiking in Maine. I parked the car and grabbed my camera as the film crew started up the trail. I was tired from the overnight hike with Scott, but tried to keep up. It would be a steep 4 mile hike so I kicked it in low gear and picked up the pace. Well over an hour later I still hadn’t found the guys and the trail circled a lake. I looked up and saw Bigelow Mountain looming high above me. Oh crap, I must have taken a wrong turn. I sat down to try to find myself on Google Maps and almost fell asleep. I got myself up, shook myself awake, and headed back down the trail. I came to a junction and realized where I’d gone wrong. It was 2 more steep miles to the summit and I would almost surely miss Scott, but I had to try. I cranked up the rock stairs and reached the top to find some fans who told me I had just missed Scott. Bummer. I descended the mountain, exhausted, dejected, and famished. I needed food. The last warm meal I had eaten had been 2 days prior and I was sick of granola bars. I sent a text to the film crew and planned to meet them at the Kennebec River Brewing restaurant near the next trail crossing. I hopped in the car, Google mapped my drive, and was surprised to find that I had 90 minutes of highway in front of me. The Maine locals were fond of giving a standard response each time we asked for directions, “Where do ya want to go? Oh, you can’t get thear from heear.” I didn’t understand what they meant until I wanted to move ahead a mere 25 trail miles but had to drive 90 minutes to get there. I struggled to stay awake while passing through tiny towns tinted golden by the setting sun. I neared the restaurant but it was 9:00 PM and I was exhausted. I found the AT crossing and pulled the car into the back corner of the parking lot. With my stomach grumbling I grabbed my sleeping bag and crawled into the back seat. Sleep was winning over food. I passed out. In the morning I was dreaming about refilling Scott’s pack with food and planning with his crew when I woke up and realized everyone was standing outside of my car. I kicked open the door and stumbled out, stretching my legs from being cramped in the back of a sedan. Jenny said Scott was half an hour away and asked if I knew where to get warm home fries. I sped to the Northern Outdoors resort and ordered home fries for Scott and coffee for me. I made it back just in time to hand Jenny the potatoes, grabbed the camera, and reached the Kennebec River just as Scott was jumping in the canoe. The official Appalachian Trail route crosses the Kennebec River in a boat, so Scott sat in front and paddled. On the other side Scott refueled and left for his morning run. I followed the film crew back to their hotel to get my first hot meal in three days. We ordered food and I went to take a shower. Unfortunately there was no soap, so I hopped out and looked around. I couldn’t find soap anywhere but I come across a can of Comet kitchen cleaner. I took it to the shower, sprinkled the powder in my hands, and had the grittiest, most exfoliating shower of my life. I smelled a bit like bleach, but I felt clean. I joined the film crew for our hot breakfast but we had to move on…no time to wait for hot food, again. We drove to the next trail crossing and left one crew member behind to bring our breakfast. At the trailhead we found a river crossing and the film crew went to work setting up a zipline for a video camera. I stood on a rock in the middle of the river and waited for Scott to come around the corner at any moment. An hour and a half later we hadn’t seen Scott, but the mosquitoes had definitely made themselves at home on my arms, legs, and feet. When Scott did arrive he made a quick rock hop crossing and was gone. As soon as he left we attacked our cold breakfast platters. I packed my gear and headed to Bangor, I needed to meet Luis there and pick up a few items. It was a 2 hour drive, but after grabbing Luis and dropping off our laundry we went to a pub downtown for a cold beer and my first warm meal in over 3 days. We drove back to the trail and headed into Monson for the night. Luis and I stayed in the Lakeshore House Hiker Hostel, had a beer in the downstairs bar, and charged the camera gear overnight. In the morning we were moving before sunrise, driving out of town to meet Scott at the entrance to the 100 Mile Wilderness, the most remote section of the Appalachian Trail. Scott took off into the wilderness and we followed the film crew to a local joint for a lumberjack breakfast and drove the logging roads to the next trail junction. We photographed Scott several times throughout the day, meeting him at remote trail junctions via rugged logging roads. That evening Scott would be wading through a wide river crossing that I had remembered from my hike. I told Luis and the film crew and we agreed that we should document it. We made our way to the river, the film crew set up an epic zipline shot and I sat on the bank with a camera while Luis stood in the chilly water. We waited for Scott, and as the light faded he rambled down the trail just in time. I was able to snap the below photo, edited by Luis Escobar, making me look like a much better photographer than I really am. As the sun set we drove out of the wilderness with the film crew to get a hotel and recharge the gear. The next morning we were up early and ordered another lumberjack breakfast before hitting the road. Back out in the wilderness we battled the mosquitoes and black flies to tramp along and get shots of Scott. 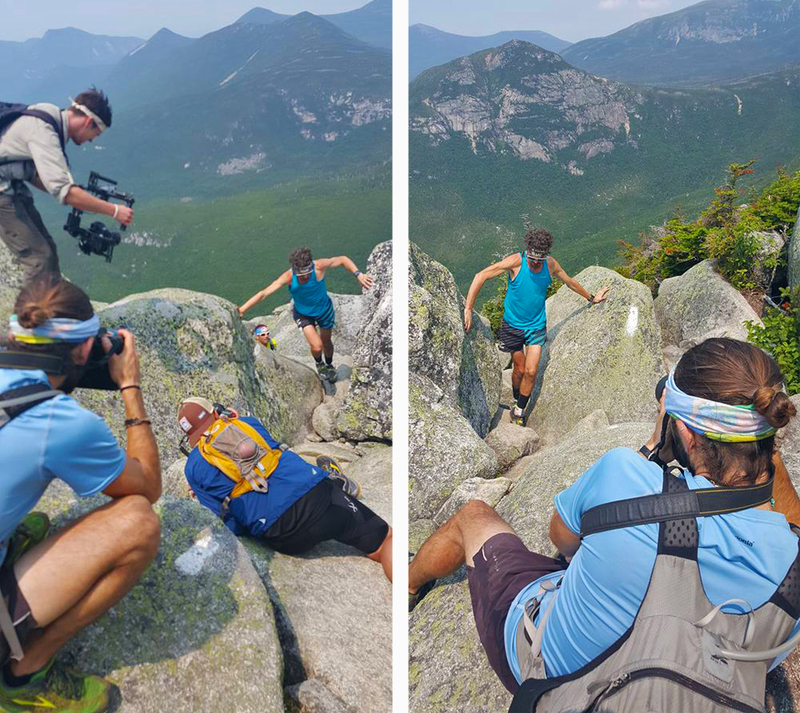 We hiked up a four mile trail with the film crew to document Scott running across some exposed ledges. 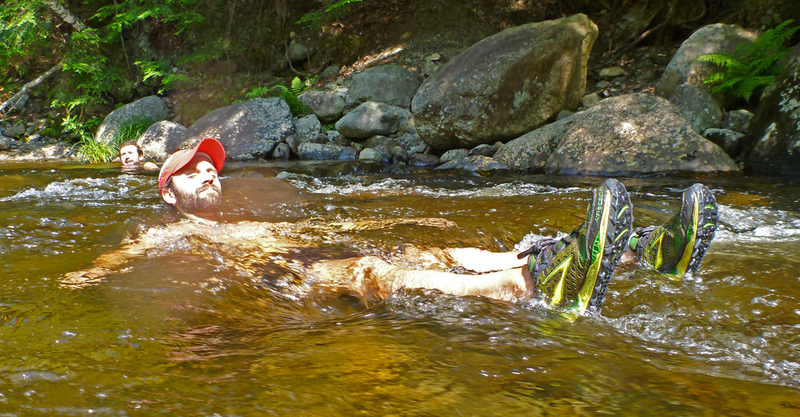 After he passed we descended the trail took a quick dip in the river. It was cold but refreshing, and laying in the clear mountain water was exactly what we needed. Soaking in the cold mountain stream. Luis and I caught Scott one last time before the light began to fade and made photography irrelevant. We decided to move ahead and camp near Abel Bridge at the south entrance of Baxter State Park. Scott’s crew showed us directions on a map and we hopped in the car. The roads are not really marked in the 100 Mile Wilderness, and an hour later we were thoroughly lost. We tried to find our way out, but with the light fading we were a little worried. Luckily a truck drove past and we waved it down. They gave us some easy directions to get back to town and we made our way out. Before exiting the wilderness we were driving down a dark dirt road when a black flash passed through our headlights. We couldn’t quite make it out, but it was black, long, low to the ground, agile, with a tail that reached nearly half way across the road. “What the heck was that? !” we asked each other. We stopped the car, a little weirded out, and could only come up with one answer, it had to be a flying monkey from the Wizard of Oz. Let’s get the heck out of here! Luis and I once again learned what “You can’t get thear from heear” means. We needed to get to Abel Bridge, and Google Maps told us to turn around and drive through the 100 Mile Wilderness. With no paper maps, no sunlight, and a small rental sedan, we didn’t think taking remote logging roads would be smart. We decided to drive around the other direction. The longer route took us 5 full hours to reach Abel Bridge. We arrived long after dark, pitched our tents along the road, and waited for Scott. Scott completed the 100 Mile Wilderness and took a quick nap. We were now 15 miles from the end and Luis and I filled our running packs to do the last stretch with Scott. At sunrise everyone was moving. Scott loaded up and walked across Abel Bridge, looking up at Mount Katahdin. Luis and I led the way, taking photos and following the white blazes through Baxter State Park. Ten miles later we reached the parking lot and surprised everyone that we had covered the section so fast. Scott had been running for 46 straight days, but he was strong, and almost done. We refilled water, packed snacks, and signed in at the trail register. The last 5 miles would not be easy, but they would be epic. When Scott reached the boulders leading to the tablelands we asked everyone to hang back and got some amazing photos of Scott scrambling up the rocks. We realized that while taking photos it was hard to follow the white blazes, so we called Aron Ralston ahead and he led the group, holding his trekking poles above his head like a tour guide in Las Vegas. We had fun following Aron, listening to his jokes along the way. At one point Scott was struggling up a rock scramble and Aron stood at the top. When Scott made it over the ledge Aron said “Hey, I was gonna offer you a hand, but then I remembered…” (punch line – Aron is the guy who got into trouble in Utah and had to cut off his arm, remember the movie 127 Hours?). We crested the last technical rock scramble and crossed the tablelands. The Katahdin sign was in sight, along with the colorful specs of people waiting for Scott at the summit. Luis and I ran ahead to get the best positions for photos. 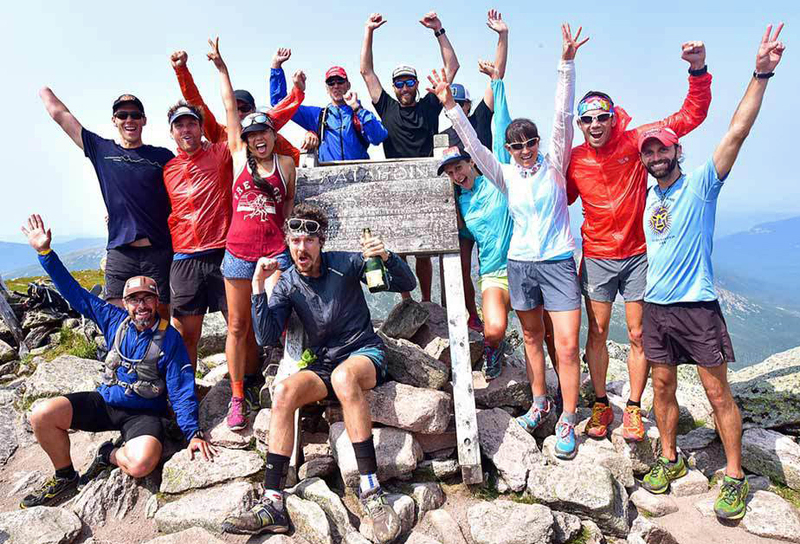 Scott pushed the last hundred feet, running to the Katahdin sign, touching it, and kissing it while everyone cheered. Note: Watch Luis and I run past the camera in the first 15 seconds of the video of Scott’s finish! We celebrated at the top and I stepped up to get a photo with Scott as Appalachian Trail Thru-Hikers. Scott grabbed my shoulder and called out to everyone, “This guy carried all of my gear overnight for 31 miles in the rain!” Well, John carried a lot of it too, we were happy to help! The descent off the mountain was nearly as hard as the climb. The scramble was fun as Aron and I rock hopped, taking unnecessary risks to explore new routes. At the Katahdin Spring creek crossing Aron dared the group to hop in the icy cold water and said “Three dunks or it doesn’t count!” We all jumped in and shrieked as we submerged in the frigid water. We reached the Katahdin Springs Campground in the early evening hours and three park rangers immediately pulled Scott aside. A lot has been said about what happened at Baxter State Park that day so I don’t need to go into details. Scott acquired three citations, including group size, open container, and littering when he sprayed champagne on the ground because it would attract animals to the summit. I guess Baxter State Park takes the sobriety of their guests, and their wildlife, very serious. That night Luis and I joined the film crew at their cabin to relax and celebrate a job well done. We picked up pizza at the pub as we were eating I looked over the taxidermy animals around the room. “Luis…there it is, that’s what we saw in the wilderness the other night.” We called the manager over and asked what kind of animal it was. “Oh, that’s a Fischer Cat, they are rare to see in the wild, and pretty dangerous if you come upon them on foot.” Good thing we were in the rental car. The next morning we looked over the car, it had been through a lot. Hundreds of miles, many on logging roads, had taken a toll. It was filthy, and a section of the plastic molding on the underside had broken away when we bottomed out on a dirt road. I used a kitchen knife to saw away the pieces hanging down, washed the car, and decided that it looked as good as new. We drove back to Boston and Luis flew home California that evening. I found a dark corner booth in an empty restaurant, laid out my sleeping bag, and airport stealth camped until my flight the next morning. After my 2012 thru-hike I had always said that Maine was one of the most beautiful states along the trail. I dreamed of returning and taking it slow, enjoying the trail, mountains, and lakes. Well, I had returned, but slowing down wasn’t an option. 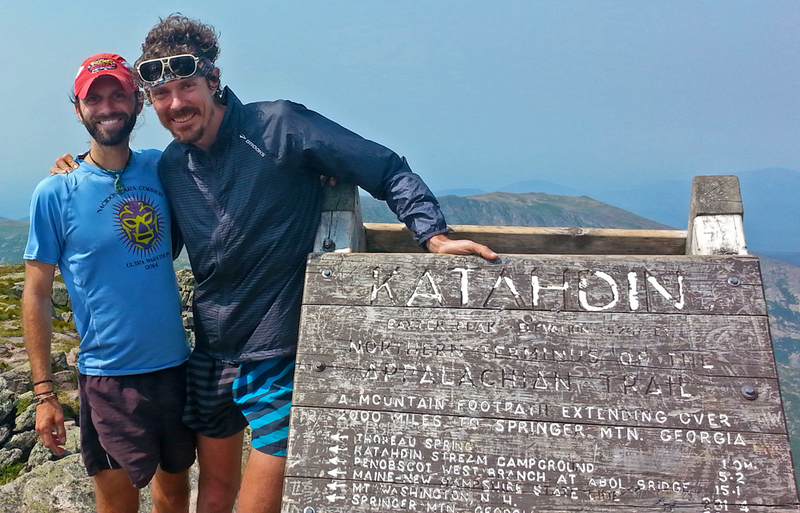 It was an incredible journey to spend the final 9 days with Scott Jurek on his record breaking Appalachian Trail hike. The time we spent in the woods chasing white blazes was a lot of fun. 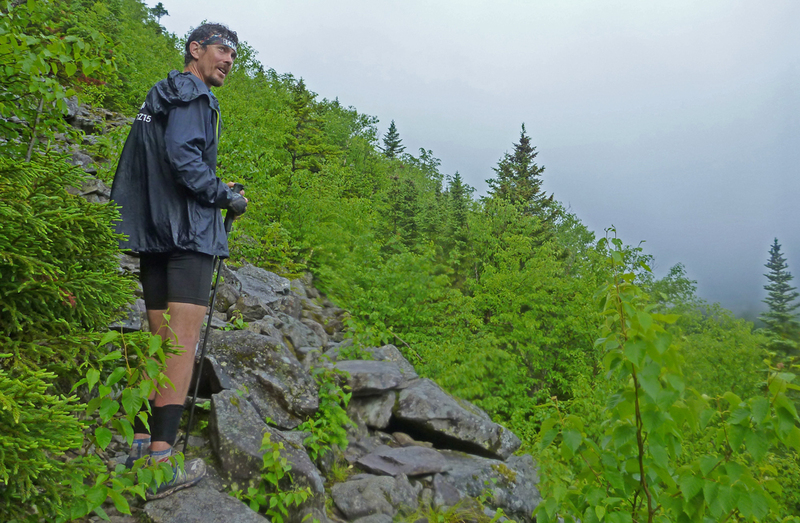 He is the king of ultrarunning, but out on the trail, he was just another guy, another friend, and another thru-hiker, albeit, a pretty fast one. When people ask me what the best part of my thru-hike was, I always answer, “the people.” Returning to the trail with Scott this year, I still agree. It was the people that made my 9 days in New England an amazing experience. There is something raw and natural about connecting with people out in nature, away from the everyday convenience and comforts of normal life. It is the friendships, the stories, and the adventure that we shared together that I will remember forever. And of course, I owe a huge thank you to my buddy Luis, for trusting me to help him photograph such epic occasion. 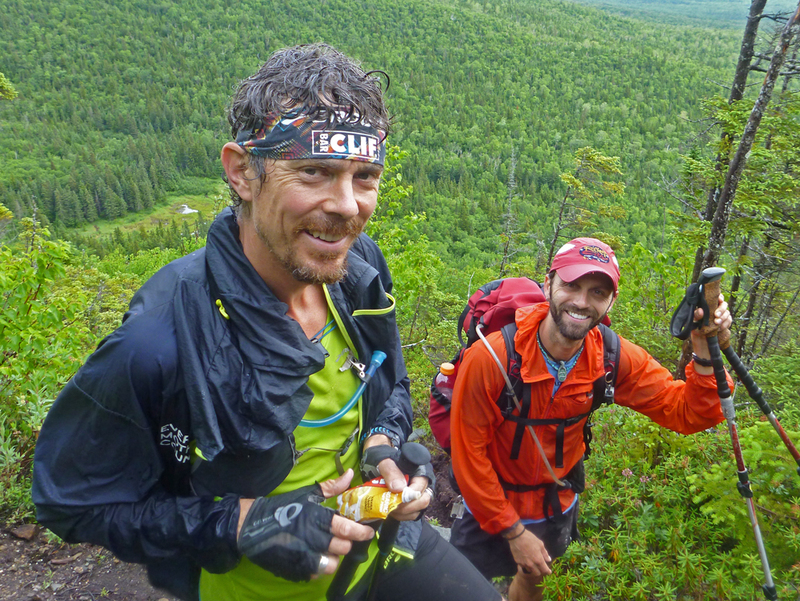 Scott Jurek celebrating with his crew on Mt. Katahdin. Heck yeah, Tarzan! Some of my best memories of the AT in 2012 were spent with you, like that one time we ran from that Yoga festival in Vermont to Sunshine’s house for trail magic. Fastest 15 miles I’ve ever done… Crazy fast! Good times brotha! Haha, yes! I bet we did those 15 miles just as fast (or faster) than Scott did! It’s amazing what warm food, a shower, and beer can make a thru-hiker do! Wow, what an absolutely epic 9 days! A great look at all the photography, pacing, meal prep, and camp prep that happened behind the scenes.